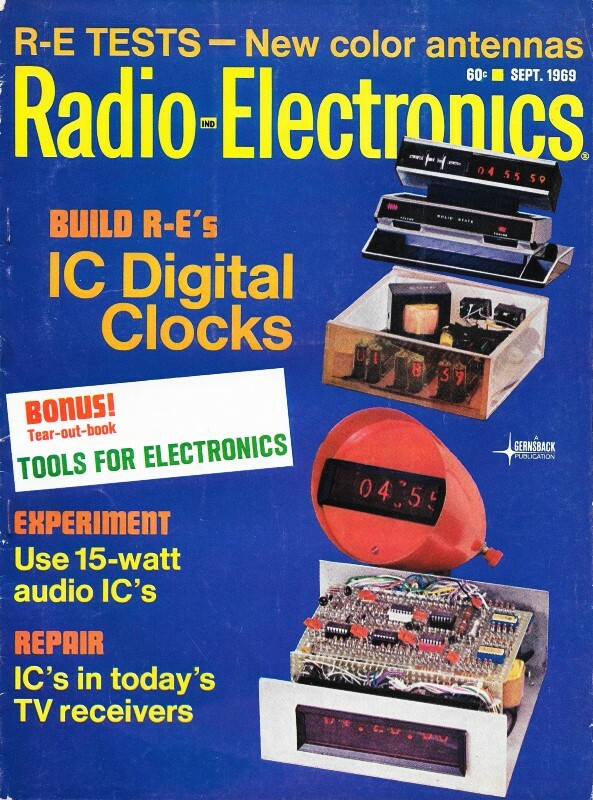 This is part 4 of the "All About IC's" series that appeared in Radio-Electronics magazine in 1969, where author Bob Hibberd discusses the various types of integrate circuit (IC) families. He is not referring to TTL and CMOS with divisions into small scale integration (SSI), medium scale integration (MSI), large scale integration (LSI), and very large scale integration (VLSI) like we have today. Back in 1969 the IC world was still evolving through basic circuit structures like diode-diode logic (DDL), diode-transistor logic (DTL), resistor-transistor logic (RTL), direct-coupled transistor logic (DCTL), etc. What seems obvious now needed to be learned and dealt with then. It is like struggling with a homework problem and being able to look at the answer worked out in the back of the book where the solution then looks obvious. This is a great opportunity to become familiar with what those esoteric terms you hear occasionally mean. Here is an interesting, nearly related bit of trivia I found while searching for information in this article: The Apollo Guidance Computer (Block II) used only a single type of logic gate - a 3-input NOR. Any other type logic gate can be made from a combinations of NOR gates. The schematics in the referenced NASA document indicate it was in the form of resistor-transistor logic (RTL). See Part 1, Part 2, Part 3, Part 4. Also, see "How IC's Work: Integrated Circuit Logic Families." A logic system to do a particular job can be designed using "black boxes" which have defined input and output conditions. From the viewpoint of the logic system, it does not matter what is in a box, only what it does. Integrated circuits are the accepted choice for the logic circuits inside the boxes, but there are many ways to use them. Different manufacturers have adopted different approaches to circuit design. These families of logic circuits - RTL, ECL, DCTL, DTL, TTL, etc.-may have bewildered and confused those not intimately concerned with integrated circuits. This issue, the "classic" families of integrated logic circuits are described, to help the non-expert engineer and technician to become more familiar with their operation and with the differences between the several types. No attempt is made to present detailed, specific information on any of the types. If you understand the basic design and operation, the details of a particular type are best obtained from the manufacturer's data. Fig. 1 - Direct-coupled inverter arrangement generates a logic 0 output similar to the input at Q1 when Q2 is driven to saturation by Q1's "1" output. Early digital IC's were based on discrete component circuit designs, and were not necessarily the best arrangement. They were followed by better types, designed to use the capabilities and economical considerations of monolithic integrated circuit techniques. Although some of the earlier types are now tending to drop out, they are included here to present a complete picture. Most digital IC's operate between cutoff and saturation, and the various types differ in the logic coupling between inverter stages to give NOR or NAND circuits with the required fan-in and fan-out properties. Before describing the various families, let's look at the general characteristics of integrated circuit logic gates. Logic circuits are normally connected in cascade - the output of one gate is connected to the input of one or more subsequent gates, and so on. Thus, the switching action of one circuit depends, not only on its own output characteristic, but also on the input characteristic of the next gate. Consider the simple case of one inverter circuit driving another (Fig. 1). Assume that the input of the first stage is initially positive (logic 1) and is pulsed almost down to zero (logic 0). With the second transistor not connected, the first-stage output voltage at B will swing from VCE(sat), about 0.2 volt (logic 0) to VCC (logic 1). Now consider what happens if the second stage is connected. 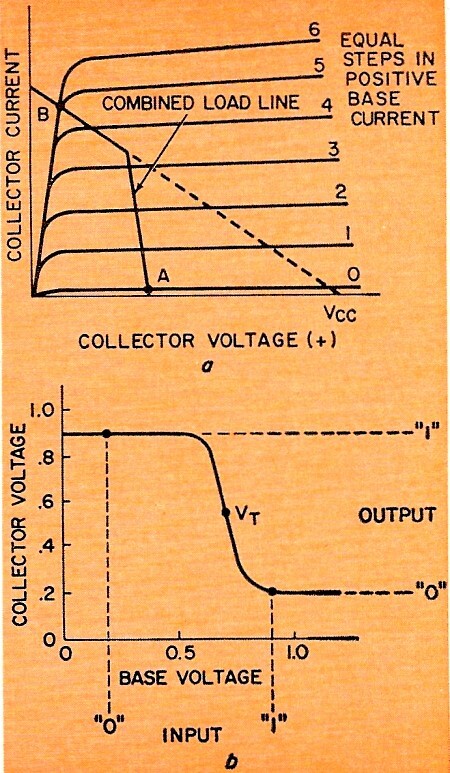 When the input voltage to the first transistor falls, its collector voltage starts to rise toward VCC, but when it reaches about 0.7 volt, the base-emitter junction of the second transistor starts to conduct, and current flows down through RL into its base. Then the voltage at Q1's collector is held at Q2's base-emitter diode voltage and does not rise above about 0.9 volt. Thus, the voltage swing at Q1's output is from 0.2 volt (logic 0) to 0.9 volt (logic 1). The value of RL is such that the current flowing into Q2's base drives Q2 into saturation, and its collector voltage falls to VCE(sat) to give a logic 0 at the output of the second stage. Fig. 2 - Combined load line for Q1 is shown in "a," while the voltage transfer, characteristics is drawn in "b." Load resistance RL and the input characteristic of Q2's base-emitter junction result in a combined load line for transistor Q1, as in Fig. 2-a. The forward voltage transfer characteristic is now as shown in Fig. 2-b. 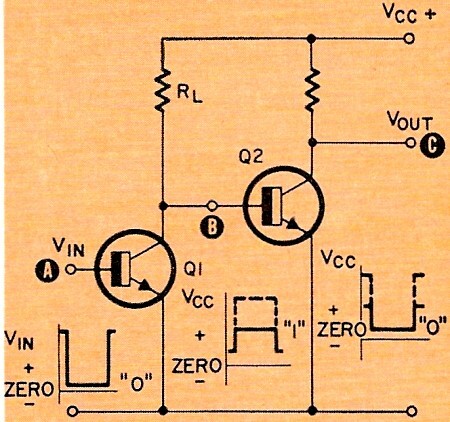 You can see that the output swing of transistor Q1, from 0.2 volt (logic 0) to 0.9 volt (logic 1), gives satisfactory operating points for the input of transistor Q2, which in turn gives the same swing at its output when it is connected to the input of the next stage. The conditions for satisfactory switching between the two states are these: When Q1 is saturated, its collector voltage must be low enough to keep Q2 cut off. And when Q1 is cut off, the base current flowing into Q2 must be high enough to saturate Q2. The two operating points with this simple direct-connected circuit are well defined, the 0 state by the collector saturation voltage of the transistor, VCE(sat) and the 1 state by the base-emitter diode voltage of the transistor in the saturated condition, VBE(sat). The voltage level at the input of a circuit, at which the circuit changes from one state to the other, is called the threshold voltage. One approximation to this is the voltage at the midpoint of the transition between the two states. This is the point VT in Fig. 2-b, the threshold voltage in this example being 0.7 volt. In many logic circuits, the value of threshold voltage is partly dependent on the base-emitter diode characteristics. Since these change with temperature, the threshold voltage also changes with temperature. The detailed circuit design must allow for this. Later we will see how the value of threshold voltage also depends upon the circuit arrangement. In logic systems, "noise" refers to any unwanted voltage at the input of a circuit. If such a noise voltage is high enough, it could cause the circuit to change state with no change in signal voltage, causing false operation. The difference between the operating point and the threshold voltage gives a measure of the noise margin of the circuit - the maximum value of noise voltage that the circuit can tolerate without changing states. The operating points are usually dependent on temperature, in addition to the threshold voltage, so the noise margin of the circuit is also temperature-dependent in operation. It is relatively straightforward to specify the DC noise margin of a circuit, but more difficult to define and specify AC noise margin because of transient effects. More will be said about noise immunity later during the description of the various logic families. Fig. 3 - A logic 1 (positive) input to this DCTL NOR gate at A, B or C causes a logic 0 output. 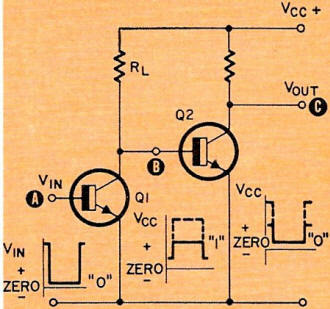 However, transistor variations can hinder this type of circuit. Fig. 4 - Adding base resistors to this basic DCTL circuit reduces current-hogging effect of setup in Fig. 3, but added RC value lowers switching speed. It takes a finite time for a circuit to change from one state to the other. In a transistor, this is the time required for the base current to supply charge to, or remove charge from, the capacitive elements associated with the transistor structure, to produce the required voltage change at the output. In a circuit, additional time is required to charge any capacitance associated with the load. Thus there is a time delay between the application of a signal at the input, and the change of state at the output. 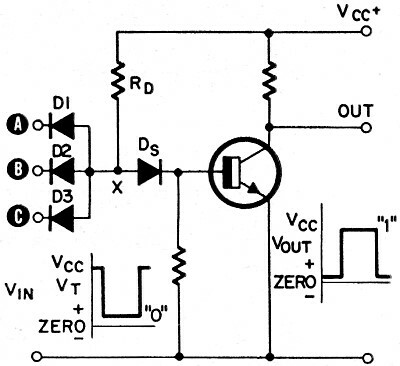 This time delay is called the propagation delay of a circuit. Values of delay vary considerably, depending on the particular circuit and transistor structure, but with integrated logic circuits are usually in the range of 5 to 50 nsec per gate (a nanosecond is 10-9 sec). In a complete logic system, a number of gates are connected in series, and the overall propagation delay is the delay per gate multiplied by the number of gates in series. An electric current propagates along a wire at a rate of about 9 inches per nanosecond. With discrete component circuits, the time delay due to the current traveling along the interconnecting wires could be comparable to the circuit delay. With IC's, the interconnections are very short, and the time delay due to current propagation is usually negligible compared with the circuit delay. The fan-out is the number of circuits a gate can drive from one state to the other simultaneously. Each circuit has an associated input resistance and capacitance, and the driving gate must be designed so its internal impedance allows sufficient voltage swing to be produced at its output with all load circuits connected. The fan-in is the number of inputs a gate is designed to accommodate. All semiconductor devices are temperature-sensitive, and a circuit can operate satisfactorily only over a certain temperature range. The IC manufacturer designs his circuits according to their intended application, and specifies their operating temperature range in his data sheets. Military types are generally specified to operate between -55°C to + 125°C and industrial types between 0°C to +70°C. The power dissipation of a logic circuit is usually defined as the supply power required for the gate to operate with a 50% duty cycle, that is, equal times in the 0 to 1 states. The power dissipation of typical logic integrated circuits ranges from a few milliwatts to about 50 mW per gate, depending on the type of circuit. In general, high-speed circuits with short propagation delay require higher power. As stated earlier, there are several logic circuit groups or families, based mainly on different methods for carrying out the logic and coupling to inverter stages. For example, in Direct-Coupled Transistor Logic (DCTL), transistors are used for the logic with direct coupling between stages. With Resistance Transistor Logic (RTL), series resistors are included in a DCTL circuit. Diode Transistor Logic (DTL) uses diodes as logic elements, and Transistor Transistor Logic (TTL) uses a multi-emitter transistor instead of the diodes. In Emitter-Coupled Logic (ECL), the circuits are coupled by a common-emitter resistor, and Complementary Transistor Logic (CTL) uses a combination of pnp and npn types of transistors. For each family, variations of a basic gate circuit are used to design a range of logic circuits with compatible input and output logic levels. In a complete logic system, it is generally necessary to use logic circuits of one family only. In the DCTL system, the output of a gate is directly connected to the input of the next gate. A DCTL NOR gate is shown in Fig. 3. The input voltage is normally derived from the collector of the previous gate and the output connects directly to input of the following gate as indicated by the dotted circuits. If a positive voltage (logic 1) is connected to input A or B or C, the respective transistor saturates and the output voltage drops to the saturation voltage of the transistor to give a logic 0 output. With the dotted driving and load gates connected, the logic voltage swing at both input and output of the NOR gate is approximately from 0.2 volt for logic 0, to 0.9 volt for logic 1, as previously described with reference to Fig. 2. The threshold voltage will be about 0.7 volt. The advantage of the system is its simplicity, but the problem is that its operation is affected by slight differences between the characteristics of different transistors. If one transistor has a base-emitter voltage slightly lower than others in parallel, it takes most of the available current and prevents proper overall operation of the circuit. This is called current hogging. To reduce the effect, resistors are included in series with each base lead, so that the base current is less dependent on the individual base-emitter characteristics. The circuit is then known as Resistor Transistor Logic. The simple DCTL circuit is now rarely used and will not be discussed further. Fig. 5 - Faster switching speed can be gained in RTL circuits by paralleling series resistors with capacitors to bypass leading and trailing pulse edges. Fig. 6 - NAND gate circuit using input diodes. DTL is faster than RTL circuits. 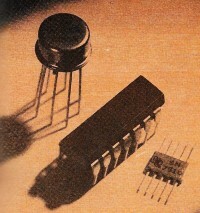 Resistor transistor logic was the first family of logic circuits established as a standard catalog line. The basic arrangement is in Fig. 4. Here you can see the series resistors added to each transistor. By reducing the current-hogging effect, the use of the resistors allows a larger fan-out. Against this, the series resistors have an adverse effect on the switching speed of the circuit, since the input capacitance of the transistors must now be charged and discharged through additional resistance which gives the circuit an increased time constant. Thus with RTL, there must be a compromise between fan-out and switching speed. 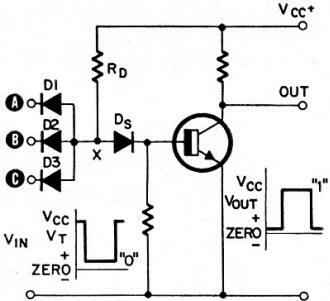 Typical values are a fan-out of 4 or 5 with a switching delay of 50 nsec. The operating points and logic voltage swing are similar to those for the DCTL circuit. The RTL circuit has a relatively poor noise immunity. The noise margin from the logic 0 state to the threshold voltage is about 0.5 volt, but from the logic 1 state to the threshold voltage it is only 0.2 volt. Switching speed of an RTL circuit can be improved by adding a capacitor in parallel with the series resistor. This variation is called Resistor-Capacitor Transistor Logic (RCTL) and is shown in Fig. 5. The capacitor lets leading and trailing edges of a signal pulse bypass the resistor so the transistor input capacitance charges more quickly. The use of the capacitor also allows higher values of resistor, with the possibility of lower power dissipation per gate. The RCTL circuit, however, is not ideal from the IC viewpoint as it includes a high proportion of resistors and capacitors, which are relatively costly because of the large area they occupy. Both RTL and RCTL circuits are still used in established equipment, but are rarely used for any new development. The next family of integrated logic circuits to become established is the diode transistor logic circuit shown in Fig. 6. The logic is performed by input diodes D1, D2 and D3, and the signal is then coupled through series diode D, to an inverter stage consisting of a transistor and its load resistor. The overall DTL circuit constitutes a NAND gate. If all inputs are at logic 1 with a positive signal voltage equal to VCC, the three input diodes are reverse-biased and pass no current. Series diode D, is forward-biased and current flows through RD and DS into the base of the transistor and holds it in saturation, with the low collector voltage, VCE(sat) giving a logic o at the output. If one of the inputs drops to ground potential, logic 0, the corresponding input diode conducts and current flows down through RD and the diode. The potential at X drops to the voltage across the input diode, which is now about 0.7 volt. This is not sufficient to drive current through diode D, plus the base-emitter junction of the transistor in series. 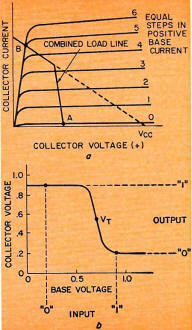 Thus no base current flows, the transistor is cut off and the collector potential rises to VCE to give a logic 1 output. Going back to the condition when all inputs are at positive VCE potential, the input diodes are reverse-biased and current flows through RD and DS into the base of the transistor. The potential at X is approximately 1.4 volt, 0.7 volt across series diode D, and 0.7 volt across the base-emitter junction of the transistor. Now let one input voltage be reduced gradually. For the associated input diode to start to conduct, it is necessary to reduce the input voltage down to 0.7 volt so that there is a forward voltage of 0.7 volt across the diode. Then the diode conducts, the voltage at X falls to 0.7 volt and the transistor is cut off. So the threshold voltage of this circuit is 0.7 volt. If two diodes in series are used for Ds, the threshold voltage is increased by an additional 0.7 volt to 1.4 volt (this is usually done in practical DTL circuits). With a logic 1 input, the input resistance of the gate is high-the diodes are reverse-biased, and so the gate does not load the previous circuit. Thus the logic 1 output level from a previous DTL circuit can be the full supply voltage VCC. If this is set at 4 volts, the two operating points at input and output of the gate will be 0.2 volt for logic 0, and 4 volts for logic 1. If two series diodes are used with a threshold voltage of 1.4 volts, the o state noise margin will be 1.2 volts, substantially better than that of the RCTL circuit. The DTL circuit switches faster than the RTL circuit since the signal passes through the low forward resistance of the diodes to the transistor. A typical delay time is 25 nsec. A high fan-out up to the order of 8 is possible because of the high input impedance of the subsequent gates in the logic 1 state. The use of diodes in the DTL gate, rather than resistors and capacitors as in RCTL, makes it more economical in integrated circuit form. In the October part of this series. we'll look at further examples of IC logic families. A few of the areas to be covered are transistor-transistor logic and MOSFET logic circuits.